While chlorine bleach remains a caustic chemical, this common laundry product offers numerous uses around the house and in the yard. Besides brightening white clothes, bleach also serves as an unbeatable disinfectant, glass sparkler and weed killer. The potent cleaning and germ killing ability of the diluted chemical in many instances costs pennies compared to name brand cleaners. Dishes and glasses often lose their luster and shine after running through repeated dishwasher cycles. Add one tablespoon of bleach to the liquid soap dispenser or around one teaspoon to sink dishwater and marvel at the difference in appearance. Nothing beats bleach for killing a variety of bacteria, fungi and viruses. Put one tablespoon in an opaque spray bottle and fill with water. Use the mixture for disinfecting countertops, cutlery boards and sinks after doing the dishes. Not only does bleach eliminate harmful bacteria on work surfaces after contact with raw eggs or meat, but also deters the microbes that create smelly dishrags and sponges. Disinfect and freshen kitchen trash receptacles using the same solution. Keep those fresh cut flowers blooming longer by adding three drops to ¼ teaspoon of bleach and one teaspoon of sugar to a quart-sized vase. Toys and waterproof articles that children often use harbor microbes during cold and flu season. Keep the spread of infection at a minimum by soaking toys in a mixture of ¾ cup of bleach and one gallon of water for up to 20 minutes. Rinse the items well and air dry. The bleach spray solution ably disinfects sink countertops and toilet surfaces. When grout develops mildew, merely spray a 1:1 solution of bleach and water onto the surface and leave for 15 to 20 minutes. Scrub the grout with a stiff brush, rinse and allow air-drying. Contrary to popular belief, bleach does brighten whites in cold or warm water temperatures. This little known tip provides an abundance of energy savings if having very many hot water loads. When encountering mildew or mold on fabrics or shower curtains, add ½ cup of bleach to the wash water and allow the machine to fill. Soak for up to 30 minutes before continuing on a normal wash cycle. Besides lawns and gardens, weeds grow in the most inopportune places that include the cracks of sidewalks, driveways and along the foundations of houses. Spray the plants with undiluted bleach and in less than a day plants wilt and die. Keep the spray away from healthy grass or other plants. Use ½ cup of bleach in one gallon of water for cleaning and scrubbing yard furniture or disinfecting garden tools. Rinse thoroughly with a garden hose. After drying metal surfaces, apply a thin coat of oil for rust prevention. Inflatable and plastic kiddie pools often provide the perfect breeding ground for microbes that cause ear, respiratory and gastrointestinal infections. Adding 2 ounces of bleach for every 100 gallons of water keeps germs at bay. 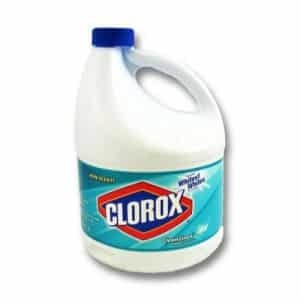 Every Time,I use clorox to clean…..